As first appeared in the April 2010 edition of the Syracuse Astronomical Society newsletter The Astronomical Chronicle (PDF). I continue to groom the Eastern sky in this month’s Constellation presentation by spending some time conditioning you to appreciate the subtle shapeliness and glowing highlights just a short clip from last month’s subject, Canes Venatici (I will endeavor to refrain from additional dry hair humor in the rest of the article). 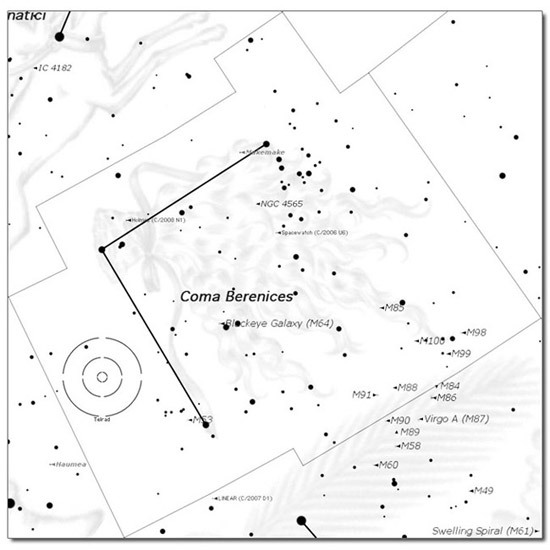 Coma Berenices, or “Berenice’s Hair,” is an unusual constellation in many respects. It is one of the few constellations that owes its name (and history) to an actual person, is one of the constellations that was promoted from a lowly asterism, it marks the location of the North Galactic Pole, and, as one of the edge-sharing constellations with Virgo, Coma Berenices contains a plethora of Messier Objects (and is an excellent constellation to have memorized if binocular viewing is in your future and you just don’t wanna wait to find something). As has been a general theme with many of these past articles, even the most simple constellations have weaved into them a wealth of astronomical treasures. “The lives of the priests were almost cut as short as Queen Berenice’s hair.” I have to assume this line has been told in one form or another over the course of the last few millennia as part of the discussion of this simple right angle. Queen Berenice II was the wife of King Ptolemy III Euergetes of Egypt, perhaps best known as the monarch under whom the great port city of Alexandria, home to such notable Greek mathematicians as Euclid and Pappus (you did know what I meant by a “right angle,” didn’t you?) rose to prominence. As history tells us, Ptolemy rode off to seek revenge for the death of his sister, Berenice promised the goddess Aphrodite her hair upon Ptolemy’s safe return, Aphrodite saw fit to collect on said offering, and Berenice offered her golden locks to Afro, er, pardon, Aphrodite’s temple. As if her bad hair day were not enough, the next morning found her offering gone from the temple. The court astronomer Conon of Samos offered the most logical explanation (much to the relief of the temple priests, who were close to getting a far-too-close shave of their own), one which was so convincing that it remains with us today. Aphrodite, well, washed that hair right away from those men, and sent it on its way… skyward. What we now know as Coma Berenices had, at one time (and likely for some amount of time after), been the furry end of the tail of Leo the Lion, Berenice’s close and equally blonde companion. It is believed that Come Berenices graduated from asterism (simply any collection of stars that are NOT official constellations) to constellation with the help of Tycho Brahe in his 1602 star catalogue (reinforced by Johann Bayer in his 1603 work, Uranometria). It is a testament to the changing times that I can mention the presence of a planetary neighbor tangled in Coma Berenices that I would not have known to mention when the new SAS newsletter began its membership cycle only two years ago. 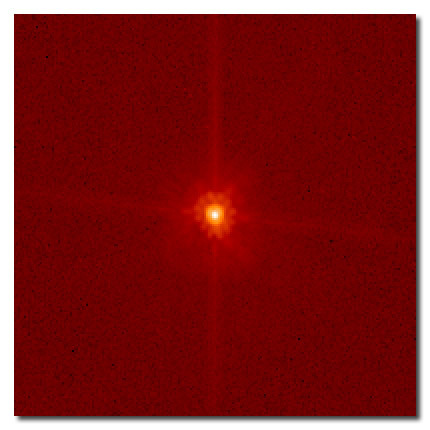 The dwarf planet Makemake (shown above from a Hubble image and provided to wikipedia by Mike Brown, its discoverer) is currently veryvery close to the south-most bright star, gamma-Com. While helping to provide a marker for one of the smallest catalogued objects in the Night Sky, Coma Berenices also marks an important location for our most important source of observables in the same Sky. 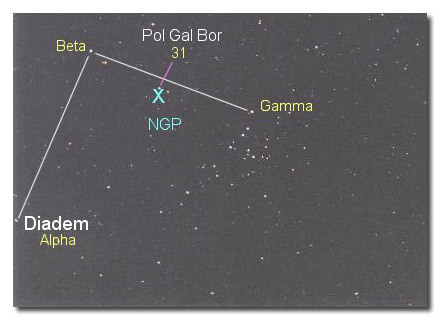 The North Galactic Pole (position shown below), is the point 90 degrees above us with respect to the galactic plane (the discussion of the Galactic Coordinate System is far too, well, large to include here, so I refer you to its wikipedia entry HERE). Coma Berenices hosts a single Messier Object that is not a galaxy, although, like hair, detail is based on proximity. 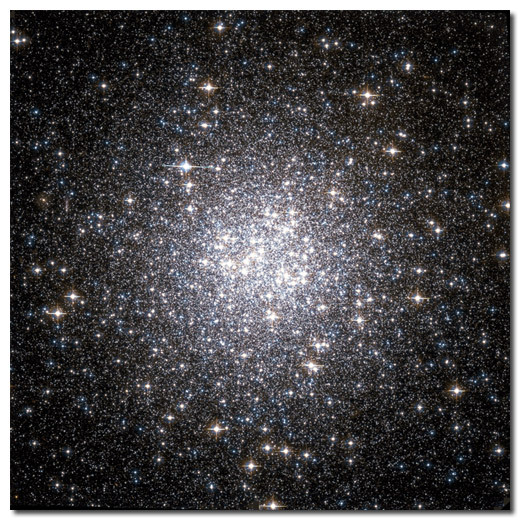 M53 is a bino-visible (7.7 magnitude) globular cluster approximately 65,000 light years away. As is often the case, our terran view (especially in CNY) does not do this object the justice provided by our tax dollars in the form of Hubble images (shown below). Looking at the constellation image at the top of this article, you may notice a bit of a knot just to the right of Makemake. As it happens, the density of stars in this region of Coma Berenices is high enough that is does have a designation as the very open cluster Melotte 111 in the less well known “other-M” Melotte catalogue. We are far too close to it for the cluster to appear to us as something like the densely-packed Pleiades, but there may be a close-by planet to the Pleiades saying the same thing about the region around our gamma-Com! 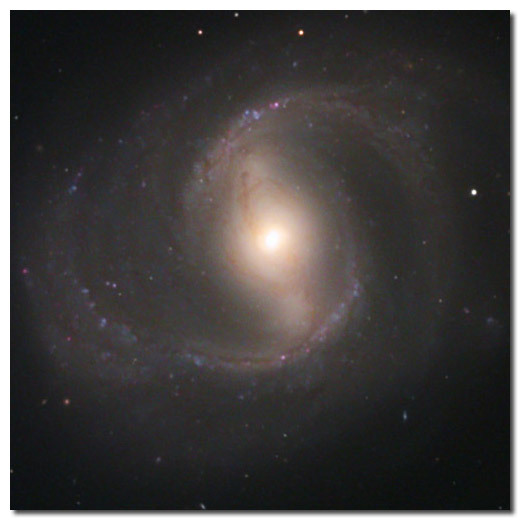 The rest of the Messier Objects in Coma Berenices are galaxies, with all but one of them bright (close-by) members of the Virgo Cluster, the gigantic collection of up-to 2000 galaxies discussed briefly in last month’s newsletter. Coma Berenices and its border with Virgo are regions that all Messier Marathoners cannot wait to have appear prominently in their early-morning March skies, as finding and checking-off these objects in your race-to-the-finish search as fast as two-in-one shampooing. The six Virgo members are (listed top-down) M85, M100, M98, M99, M88, and M91. You will note that M86, M84, M90, M89, M87, M58, M59, and M60 (phew!) are also in very close proximity in Virgo. Your problem is not finding smudge patches in your binoculars. You’re problem is finding out which one you’re looking at! The lenticular (a morphological hybrid between elliptical and spiral galaxy shapes) galaxy M85 (NGC 4382) marks the northernmost edge of the Virgo cluster. 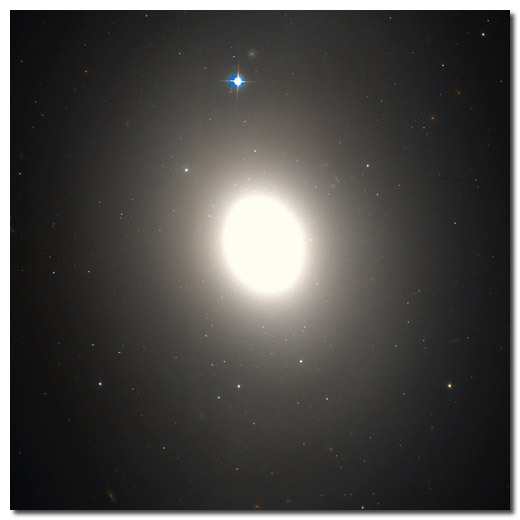 Admittedly, the detail in the Hubble image is a bit lacking (shown below), one of the signs of an old elliptical galaxy where star formation is no longer ongoing in any significant amount). This galaxy lies 60 million light years away and is the 94th MOST distant Messier Object. With M85 centered in your Telrad, you’ll find M100 just at the edge of your outer ring. M100 (NGC 4321, shown at below-left from ESO) has a shape to it that all likely think of when they picture a galaxy in their mind’s eye. One of the most prominent members of the Virgo cluster, this “grand design spiral” galaxy is 55 million light years away and has been observed intensely enough for us to know that it hosts the satellite galaxy NGC 4323. 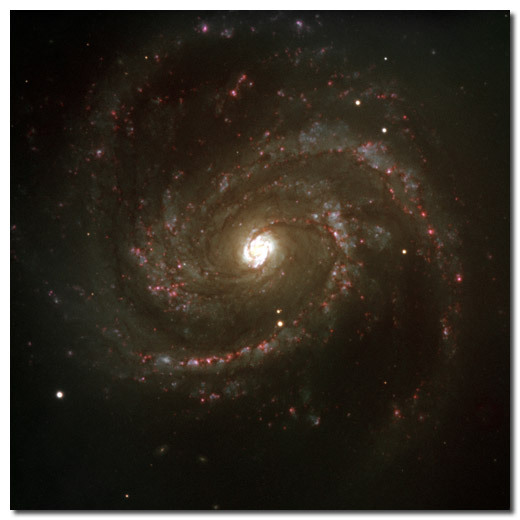 As galaxies go, M100 is jumpin’ with supernovae, with five catalogued since 1901. Centering your Telrad on M100, M99 approaches your outer ring by about the amount that M98 and M88 sits beyond it. We see the spiral galaxy M98 (NGC 4192, shown below, from Astrofotografia) almost edge-on, making for a view similar to, but less interesting that, the Andromeda Galaxy (M31). If you’re keeping excellent track of your Doppler shifting, you’ll note that M98 is racing towards us at 125 km/sec which, at 60 million light years away, gives us plenty of time to hit the salon before its arrival. 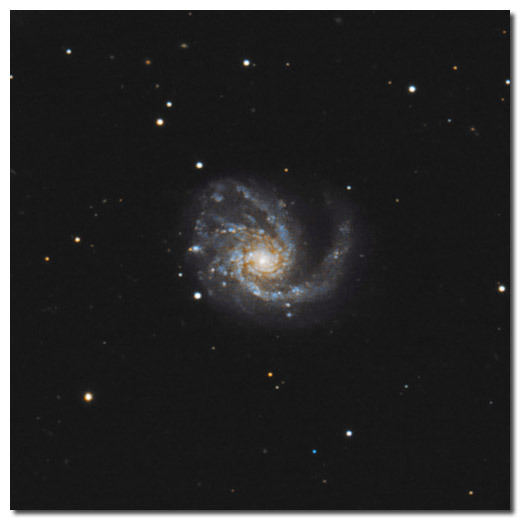 The image of the pinwheel-looking (a name that already has the galaxy M33 associated with it) M99 (below), was taken by amateur astronomer Hunter Wilson and is currently the choice image at wikipedia for this galaxy (no small feat considering the telescope competition both on the ground AND in orbit). The slight unwinding (well, slight to our eyes, but tens of thousands of light years fit into that gap) of the right-most arm is attributed to VIRGOHI21, a region of hydrogen gas and a massive amount of presumed dark matter. 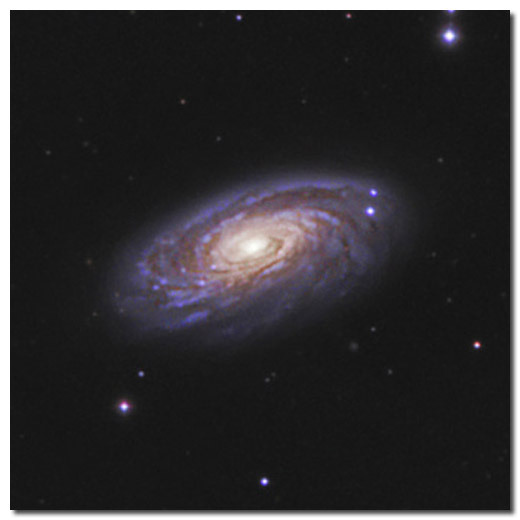 The spiral galaxy M88 (NGC 4501, shown below and also by Hunter Wilson) is racing towards the center of the Virgo cluster (in the direction of M87). This galaxy is noteworthy for its very tight and very regular spiraling that falls smoothly all the way to the galaxy core, home of a supermassive black hole 80 million times the mass of the Sun. The last Messier member of the Virgo cluster in Coma Berenices is M91 (NGC 4548, shown below). Messier (in 1781) and Herschel (in 1784) both lay claim to its discovery despite the gap in timing. The linked picture for this image is as noteworthy for the soft blending of nebulosity and starry regions as for the multitude of small galaxies also contained in the field of view. Well worth a look. 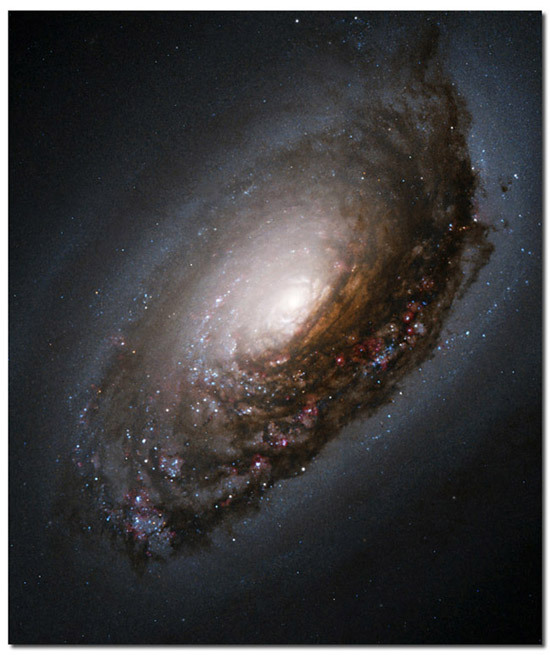 Finally, the outlier Messier galaxy in this region is M64 (NGC 4826, shown below), known to amateur astronomers as the Black Eye Galaxy. This view is obvious even in our telescopes! Not only is the galaxy interesting for the dark band pointed towards us, but it has become doubly-interesting recently with the discovery that the black band is spinning in the opposite direction of the rest of the galaxy, with the current hypothesis being that the black band is the remains of a companion galaxy that may have collided with the central galaxy one billion years ago. when you next see it, think of the astronomer Conon and the priests he saved from a similar fate.